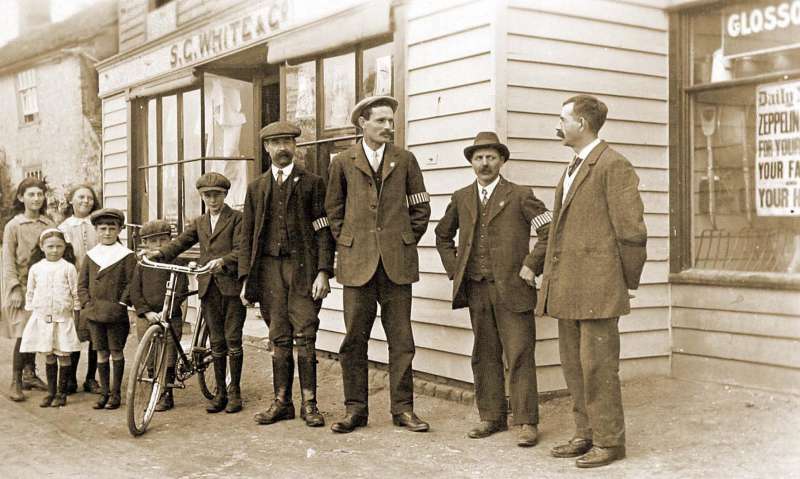 This picture, from 1916, shows Clem Hyam, second from right, wearing a Special Constable's armband. His five-year old daughter, Marjorie, is thought to be the little girl front left, wearing a white dress. The picture was taken shortly after a Zeppelin came down in Little Wigborough in September 1916. Three of the Special Constables who captured the German crew of the Zeppelin are posing outside Peldon village shop, then known as S C White and Co. They are standing with Edgar Dansie (on the right), the shop-keeper. Young Marjorie Hyam, who was to live to 103 (and died in 2014) was probably the last person alive to remember the Zeppelin coming down although she used to relate that she was told she had to stay in bed and missed it. The Hyams themselves ran a grocer's shop in the village, two doors along from S C White's. The Olde House, as it is called now, stands at the junction where the Moss Haye path comes out on Lower Road. This was the Hyam family's home for over 80 years and for much of that time they ran a shop there. Clement Hyam's father, Samuel, (1839 - 1916), was born to a Wigborough agricultural worker, James and his wife Mary. It was Samuel who was to set up the family's grocery business in Peldon. Samuel starts out as a 'hawker' in Great Wigborough. His first wife Lucy dies leaving him with two girls and two boys but by the census in 1891 he has married Eliza, and they have two more children. By then they have moved to Peldon and he is listed as shopkeeper, grocer and hardware living in The Shop (near Brick House Farm) which in every likelihood is the first reference to The Olde House being a shop. In the same census, son Clement is working in Peldon as a baker's assistant for George Smallwood and is a boarder there. The bakery was not far from Peldon church. Samuel subsequently moves to a grocery shop in West Bergholt while son Clement takes over his father's house and business as a grocer in Peldon. Following their marriage in 1897, Clem and his wife Edith are living in the Olde House and running the shop. Clem's shop, The Old Cottage (now The Olde House), Lower Road, Peldon, is on the left of the picture. Dansies shop can be seen next door but one. In the 1911 census Samuel and his wife Eliza have returned to Peldon, living in Hill House in retirement. Samuel was to die in 1916. By the 1911 census Clem is listed as a general dealer and born in Peldon. He is living near The Plough with Edith who is assisting in the business. They have Catherine Mallett aged 63 as a nurse for their younger daughter, as yet unnamed and under a month old [Marjorie]. They also have Norah who is 5 also born in Peldon. It was in the early hours of 24th September 1916 that Clem was to experience probably the most dramatic event of his life. He was serving as a Special Constable during the war. The Special Constables had no uniform but wore arm bands on the left arm above the elbow plus a lapel badge whenever on duty as seen in the picture above. That night the Zeppelin L33 was to come down at Little Wigborough straddling Copt Hall Lane. Its Captain ordered the airship to be set alight and he and his crew, 22 men in all, set off walking towards Peldon where they were met by Special Constable Edgar Nicholas. They offered no resistance and he accompanied them to Peldon. Eventually, the men were handed over to the Police Constable and five of the Special Constables. Their work was not over for during the next few weeks tens of thousands of sightseers made their way to see the remains of the 650 foot long skeleton of the L33 and the Special Constables were needed to control the crowds and the traffic. Marjorie Costello of Melrose Road, West Mersea was born in a small room above her father's Peldon hardware store one hundred years ago Sunday 26 March 1911. Marjorie's father was very protective of his three daughters (Marjorie was the second) and would not let them near the horse he kept to cart his paraffin and oil deliveries to the surrounding villages. Neither would he allow them to cross the Strood to Mersea unchaperoned, fearing that they would be caught by the tide. Marjorie went to school in Peldon, but like many young girls at that time, left at the age of fourteen to go into service. She was taken on as a lady's maid to look after the wife of a brigadier general at Manwood House, Abberton, and remained in the same job for the next fifteen years. She remembers her years in service with great fondness. "I had a marvellous position there', she said. "I had my own room in a lovely house and the lady I worked for was very kind. I used to look after her clothes and make sure she had everything she needed. The three girls were all married at St Mary's Church, Peldon as these entries in the local newspaper report. Their parents, Clem and Edith, enjoy a long marriage and celebrate 50 years in 1947. Although a grocer's shop early on, later, the Hyams sold pots and pans and paraffin. When Clem's daughter Marjorie was talking about her father, it was almost always about selling paraffin, the purest paraffin around and an important commodity in houses where it was used for lighting and often cooking. He also sold it in Layer de la Haye; in those days before the Reservoir was built, Lodge Lane, being a through road to Layer de La Haye, made it much closer. Many locals remember Clem being called 'Tinny' on account of him selling saucepans and tins. He would deliver items bought from the shop in a horse and trap. The iron gate to the backyard of the house through which he took the horse and cart was still there until recent times alongside the path up into Moss Haye. Penny Burr (nee Pullen) who lived with her family at The Peldon Rose remembers 'Tinny'. In the 1940s he would get the bus to Colchester to buy all the pots and pans he was to sell in his shop. She remembers him getting off the bus at The Rose and walking all the way home carrying his purchases. 'Tinny' also sold sweets and tobacco. With sweets being rationed in the years following the war, Penny recalls the only sweet thing always available was Penguin biscuits. She also remembers 'Mr Hyam always had to go into the back room, the kitchen, to get any change'. Clem died in 1950 but Edith remained living in the house. When Edith's daughter Marjorie Costello was widowed herself in 1963 she decided to return to Peldon to look after her mother. Edith died in 1971, having spent all her life since marriage in the Olde House, 74 years in all. Marjorie remained in The Olde House for a short while after Edith's death before moving to West Mersea and selling the house to the Coes. Three generations of the Hyams are buried in Peldon Churchyard, Edith, her husband Clem, his father, Samuel , step-mother Eliza and half-brother Mark, and daughter Marjorie and her husband, Patrick Costello. When Mike and Jenny Coe moved in to The Olde House, around 1972, Jenny says there was an old till in the kitchen and the brick floor was worn with the passage of so many feet. Title: Small two burner paraffin stove used by donor's grandmother, Edith Hyam, from Peldon. On display in Mersea Museum. St Mary the Virgin Church, Peldon. 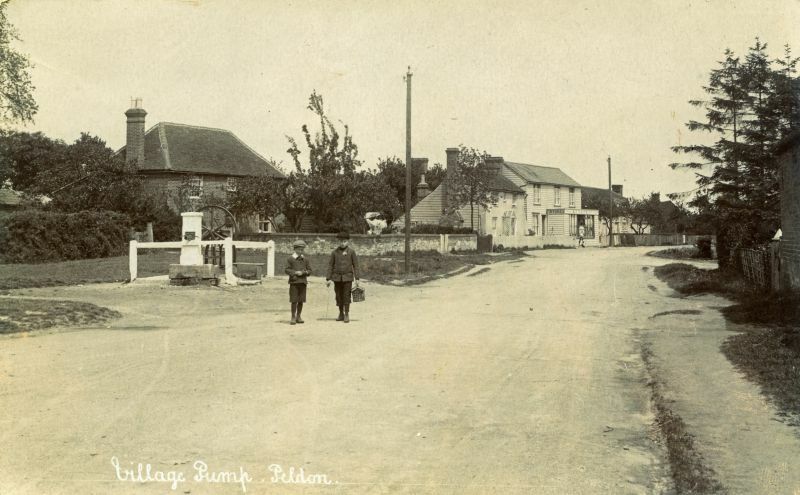 Title: Village Pump, Peldon. The Plough is just out of sight on the left. On the left behind the pump is the Old Cottage, run as a shop by Clem Hyam. The Post Office visible in the distance on the right. Hammond Postcard. Posted to Mrs Gunstead, 28a Culver Street, Colchester by Jdy. Title: Marjorie makes a century. Marjorie Costello of Melrose Road, West Mersea was born in a small room above her father's Peldon hardware store one hundred years ago. Sunday 26 March 1911 was also the birthday of acclaimed American playwright Tennessee Williams, and in the same month, Captain Robert Scott was in the Antarctic preparing for his ill-fated attempt to reach the South Pole; Henry Ford opened his first factory in England to build Model T motor cars; and preparations were under way for the coronation of the new king, George V.
Marjorie's father was very protective of his three daughters (Marjorie was the second) and would not let them near the horse he kept to cart his paraffin and oil deliveries to the surrounding villages. Neither would he allow them to cross the Strood to Mersea unchaperoned, fearing that they would be caught by the tide. Marjorie went to school in Peldon, but like many young girls at that time, left at the age of fourteen to go into service. She was taken on as a lady's maid to look after the wife of a brigadier general at Manwood House, Abberton, and remained in the same job for the next fifteen years. She remembers her years in service with great fondness. "I had a marvellous position there', she said. "I had my own room in a lovely house and the lady I worked for was very kind. I used to look after her clothes and make sure she had everything she needed. Patrick returned after the war and the couple picked up their life together in Clapham, but when her husband died at a relatively young age, Marjorie decided to return to Peldon and look after her mother. She remained in the family home until 1980 when her mother died at the age of 97, and then she moved to her current home in West Mersea. [ Marjorie's father was Clem Hyam. She died in 2014 at the age of 103.